It's back - the feature that more than 30% of you voted not to see again, and now it's got a name: Nerd vs. Food. 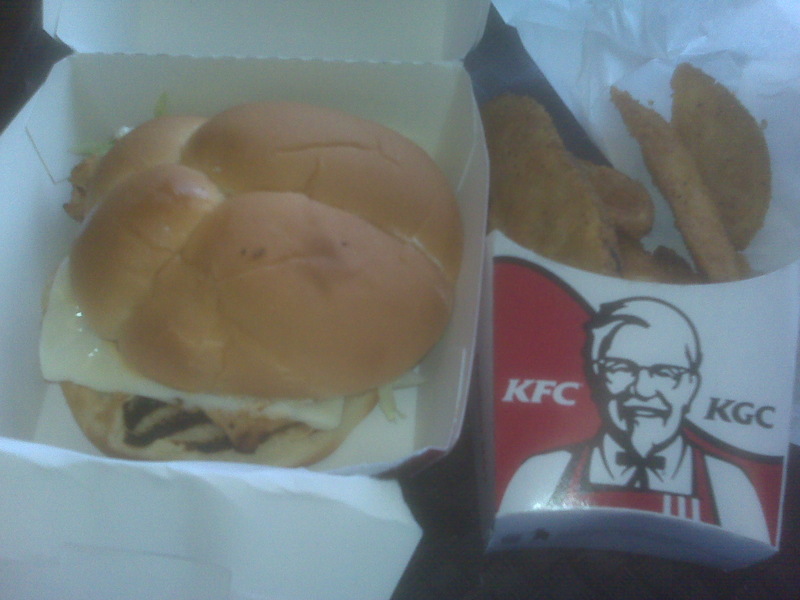 Today's subject: KFC and their Doublicious chicken sandwich. 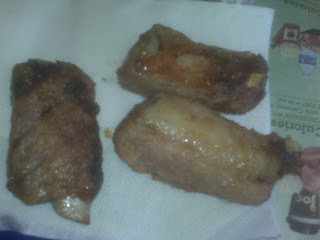 In my one previous installment of this experimental column, I decided to try out the Burger King Ribs - a waste of both time and money that I'd rather not revisit anytime soon. 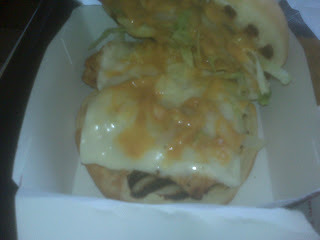 Today, I thought I would go for a "healthier" option: something called a Doublicious from KFC. The Doublicious comes in a breaded/deep fried or grilled variety, which is the route I chose on this extremely slow news day. The toppings on the grilled sandwich include honey mustard, shredded lettuce, and a slice of mystery cheese. I think it was pepper jack, although you can see it was hard to tell exactly what I was biting into. Where BK pulled an Epic Fail on my wait in line, KFC was polite and efficient, as they usually are at this particular location. No 15 minute waits, no trays that feel like they just came out of a blast furnace. An extra comedic benefit was that the guy in front of me in line looked like a cross between Peter Griffin and Bob Nutting. Unfortunately, I did not have the nerve to ask for a picture. A few minutes after ordering, a fresh Doublicious was placed in front of me, with a sidecar of the always-delightful potato wedges. One could make the argument that these are the best fast food fries next to McDonald's, although Arby's seasoned curly fries will give them a run for their money. As for the sandwich, it was a relatively palatable 380 calories, which I am certainly appreciative of. The price, with a side and a drink, came to $5.30 with tax - about average for a meal like this. But would I order it again? I'm going to have to maintain my standing as a tough critic and say no. Much like Bud Selig's All-Star Game, the Grilled Doublicious is in a no-man's land where it tries to be all things to all people. It tries to be healthy, it's tries to be indulgent, and in the end, it doesn't fall into either category. The forgettable cheese/mustard mix quickly evolved into a gooey mess, so I would advise to anyone giving this a spin to go cheeseless. And that's from a guy that always appreciates a good slice of cheese. It's just not working here. Maybe KFC should go all-out healthy on this one and dump the cheese for a slice of tomato, but the combination as it stands now isn't going to fly for this nerd. Nonetheless, KFC maintains one of my favorite lunchtime fast-food stops, so this experience will be a mere bump in the road. They're usually quick, cheap, and tasty. Not always healthy (at least not some of the things I order), but it depends what kind of mood you're in that day. Maybe I'll try the more guilt-ridden fried version of this sandwich in the near future, but I don't see any grilled Doubliciouses in front of me anytime soon. next time order the double stack. which is what im sure the PG/BN look-a-like ordered. I don't get it. Exactly what about this sandwich makes it "Doublicious". I figured that there would be two pieces of chicken or something. Does the McGangbang come with mayo? I have to say, I've never heard of the McGangbang, but this article taught me everything I need to know about it. You truly missed the boat on the KFC "Double Down." While initially repulsed by the thought, I found myself in rural Vermont for work needing some dinner, with a KFC across the street. I ordered the DD (which is the cheese, bacon, and "special sauce" sandwich with fried chicken patties serving as the bun) It was, not surprisingly, AWESOME, and the best part was that it didn't make my face feel like it had fell victim to an oil spill, and it didn't feel like a brick siting in my stomach. All in all one hell of an innovation by the Colonel. I don't mind you having food articles, but how bout choosing something different than a 100% standard chicken sandwich? This was boring. There's this misconception that because it's "grilled" that it's healthy. It's typically not. Yeah, it's probably better than eating the fried version, but it's also a trick that makes people who want to indulge in the fast food think they're staving off self-destruction. It's fast food. None of it is healthy or good for you, so if you're going to eat it, go all the way with it. I mean, when you're mashing all the condiments and cheese and whatnot onto a "grilled" slab of, uh, "meat," you've long left the land of healthy eating. That's not to trash you. I like a good fast food meal now and again. I'd fight a child over a Chic Fil-A sandwich. So I'm not trying to be all, "Fast food is evil!" It's just a pet peeve of mine and misleading (albeit effective) marketing by the fast food companies. Like, those "healthy" chicken salads at McDonald's? They'll kill you. Anyway, I still read the piece, and I enjoy this feature. Just don't kill yourself, man. Yeah, i dont get the 'double' nomer of this sandwich. Is it because it has TWO pieces of bacon? Just like every other bacon sandwich ever? Or does it just hold a two-fold lead over other similar sandwiches in the unquantifyable category of 'taste'? I gotta say. At first, "having a mcgangbang" sounds like just about the greasiest, grossest, one-way-ticket-to-hell'n-est process in which one (or several individuals) could partake. However, upon further research (aka clicking the link)... it doesn't look half bad. Might just have to try it. Although, i'm sure this isn't the 'official' McDs title... wouldn't it be great to start seeing commercials for the McGangBang? "Stick the new, delicious, grilled McGangBang w/cheese in your facehole! Bah da da da da, i'm lovin it!" Also, if Bob Nutting was wearing a t-shirt that said "I'm Bob F'n Nutting"... i don't think i would recognize him. Please do a review of the fried version, I personally like that one better, the grilled is slimy, falls apart and the colonel sauce they put on the fried doublicious tastes so much better.